‘Homeostasis’ refers to the maintenance of a constant internal environment of the body (homeo = same; stasis = standing). The importance of internal environment was notified by the great biologist of 19th century Claude Bernard. He enlightened the fact that multicellular organisms including man live in a perfectly organized and controlled internal environment, which he called ‘milieu interieur’. The word ‘homeostasis’ was introduced by Harvard Professor, Walter B Cannon in 1930. The internal environment in the body is the extracellular fluid (ECF) in which the cells live. It is the fluid outside the cell and it constantly moves throughout the body. It includes blood, which circulates in the vascular system and fluid present in between the cells called interstitial fluid. ECF contains nutrients, ions and all other substances necessary for the survival of the cells. Normal healthy living of large organisms including human beings depends upon the constant maintenance of internal environment within the physiological limits. If the internal environment deviates beyond the set limits, the body suffers from malfunction or dysfunction. Therefore, the ultimate goal of an organism is to have a normal healthy living, which is achieved by the maintenance of internal environment within set limits. The concept of homeostasis forms the basis of physiology because it explains why various physiological functions are to be maintained within a normal range and in case if any function deviates from this range how it is brought back to normal. Understanding the concept of homeostasis also forms the basis for clinical diagnostic procedures. For example, increased body temperature beyond normal range as in the case of fever indicates that something is wrong in the heat production-heat loss mechanism in the body. It induces the physician to go through the diagnostic proceedings and decide about the treatment. For the functioning of homeostatic mechanism, the body must recognize the deviation of any physiological activity from the normal limits. Fortunately, the body is provided with appropriate detectors or sensors, which recognize the deviation. These detectors sense the deviation and alert the integrating center. The integrating center immediately sends information to the concerned effectors to either accelerate or inhibit the activity so that the normalcy is restored. 1. The pH of the ECF has to be maintained at the critical value of 7.4. The tissues cannot survive if it is altered. Thus, the decrease in pH (acidosis) or increase in pH (alkalosis) affects the tissues markedly. The respiratory system, blood and kidney help in the regulation of pH. Body temperature must be maintained at 37.5°C. Increase or decrease in temperature alters the metabolic activities of the cells. The skin, respiratory system, digestive system, excretory system, skeletal muscles and nervous system are involved in maintaining the temperature within normal limits. An adequate amount of nutrients must be supplied to the cells. Nutrients are essential for various activities of the cell and growth of the tissues. These substances also form the source of energy required for various activities of the cells. Nutrients must be digested, absorbed into the blood and supplied to the cells. Digestive system and circulatory system play major roles in the supply of nutrients. An adequate amount of oxygen should be made available to the cells for the metabolism of the nutrients. Simultaneously, the carbon dioxide and other metabolic end products must be removed. The respiratory system is concerned with the supply of oxygen and removal of carbon dioxide. Kidneys and other excretory organs are involved in the excretion of waste products. Many hormones are essential for the metabolism of nutrients and other substances necessary for the cells. Hormones are to be synthesized and released from the endocrine glands in appropriate quantities and these hormones must act on the body cells appropriately. Otherwise, it leads to abnormal signs and symptoms. Water and electrolyte balance should be maintained optimally. Otherwise, it leads to dehydration or water toxicity and alteration in the osmolality of the body fluids. Kidneys, skin, salivary glands and gastrointestinal tract take care of this. For all these functions, the blood, which forms the major part of the internal environment, must be normal. It should contain the required number of normal red blood cells and adequate amount of plasma with normal composition. Only then, it can transport the nutritive substances, respiratory gases, metabolic and other waste products. Skeletal muscles are also involved in homeostasis. This system helps the organism to move around in search of food. It also helps to protect the organism from adverse surroundings, thus preventing damage or destruction. Central nervous system, which includes brain and spinal cord also, plays an important role in homeostasis. The sensory system detects the state of the body or surroundings. The brain integrates and interprets the pros and cons of this information and commands the body to act accordingly through a motor system so that, the body can avoid the damage. The autonomic nervous system regulates all the vegetative functions of the body essential for homeostasis. 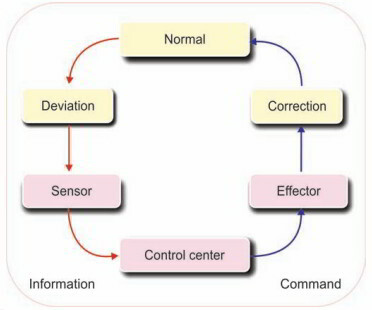 Transmission of information from the control center to the effectors for correcting the deviation Transmission of the message or information may be an electrical process in the form of impulses through nerves or a chemical process mainly in the form of hormones through blood and body fluids. Effectors, which correct the deviation.